Members Pages Here you can find a list of our current members and links to their personal pages. 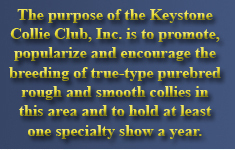 Welcome to official site for the Keystone Collie Club. We have started the process of updating the site into one that works on "Smart Devices" (i.e. Phones, Tablets) as well as it does on computers. In the meantime we hope you enjoy the current site and invite you to spend some time looking around. 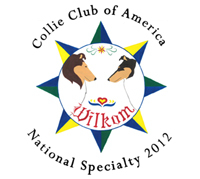 Learn more about each member and their personal experiences with collies. Find great tips on training and health care for your collie. And let's not forget the thousands of photos to be seen here. Photos of beautiful collies and even of our "not collies" friends in our all breed obedience matches. So please look around and enjoy. If you have any questions reguarding the club or just collies in general please don't hesitate to Email Us. Thank you for stopping by and we look forward to seeing you at one of our many events. Barktober Fest Collie Match and All Breed Obedience in October 2013. Held once again at Nockamixon State Park, near Quakertown Pennsylvania. KCC Monthly Meeting: Location To Be Determined. In a continuing effort to make this site enjoyable to as many people as possible we have taken into consideration the changing ways in which we access directions. Using Google's Map Editor I have created new interactive maps for people to view and also to enter in their own information in order to get personalized directions to our events. Let us know what you think. Are voted on each year and can hold office for as long as they get a majority vote and are willing. Two board members are voted for each year allowing each board member to hold office for at least two years in a row.